quite interesting textures and lighting but shapes look like a 3d beginners guide sample. i see no pigs here. I think this photon mapper is not working properly... or you are using too few photons. 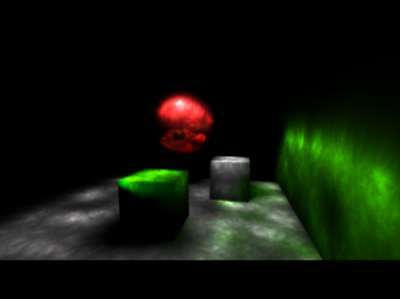 (oh, CornellBox-like scenes excite CG researchers, but you have no change with sceners). Nice effort, waiting for your next gfx! Nice aesthetic effect. Really appeals to me the final image. Well done. page created in 0.016027 seconds with 15 queries.